Stand: Ergonomically designed sturdy stand of anti rust Material. Viewing Bodies: Siedentopf Binocular OR Trinocular, 30° inclined , 360° rotatable, IPD adjustable 52-75mm. - Observation Head 45-degrees inclined Binocular head interchangeable with Monocular or Trinocular observation head. - Nosepiece Quadruple revolving turret nosepiece with positive accurate click stops. - Stage Oversize plain stage 180 x 150mm with 2 extension plates 150 x 65mm for large bottles and micro filter work. 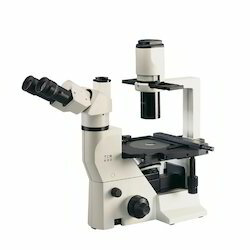 We are leading manufacturer, supplier and exporter of Inverted Tissue Culture Microscope (Olympus Opto). 3.: Tissue Culture Flask Plate 6, 12, 48 & 96 Wells. 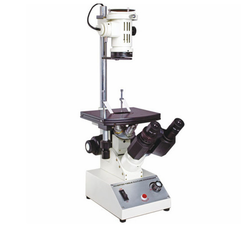 - Base : Large and Sturdy Base Provides Stability to the Microscope and Houses the Solid State Transformer Working on 6v-20w Halogen Lamp. Inverted Tissue Culture Microscope is available with all the advanced features as per the national and international norms. We design Inverted Tissue Culture Microscope very precisely to suit the examine purposes of living cells and tissue culture. High illumination power of our Inverted Tissue Culture Microscope distinguishes it from other brands present in the market.